I spent last Saturday with my son jumping from spot to spot as we drove along the Missouri downstream of Holter Dam. My wife and daughter were having a "girls' day" in Bozeman, so what better to do than hit a stream. Mostly I just wanted to see what the pulse of the river was as the rainbow spawn gets underway and to get my son on the edge of some water. He's not the fisherman I was at five years old, or at least thought I was, but he's not opposed to it either. He doesn't last as long at it as I wish he would, but I'm patient and not pushing it. The adventure eventually gave way to him climbing rocks, digging holes, and building a spent shotgun shell collection - as I continued to pick apart eddies and experiment. He didn't catch any on this outing, but he was still living on the high of his last trip out when the weather broke and temps stayed above freezing long enough for me to take his little fingers near water. On that day I'd plunked him down above an eddy that slammed into the bank at his feet and the depth dropped away instantly - meaning that all of his cast, no matter how poorly executed, would be in productive water. I rigged him up with a nightcrawler on a pencil lead bait rig and cut him loose. 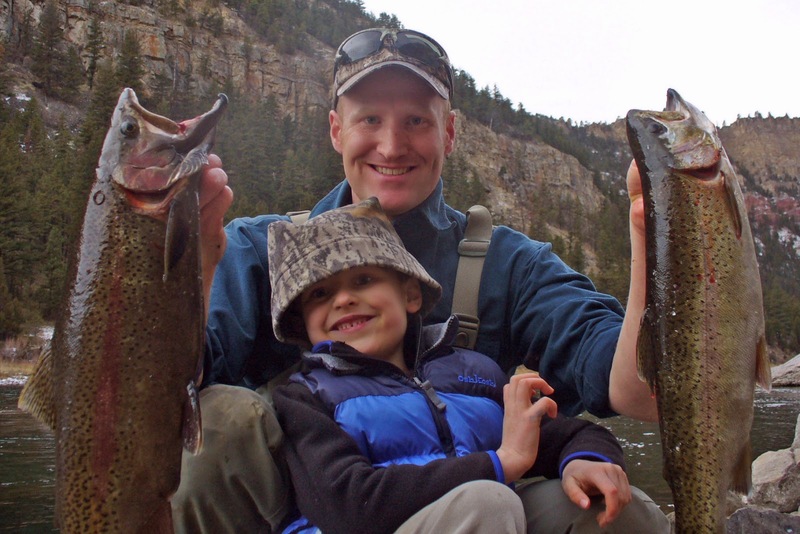 We only caught two fish that particular afternoon, but it was a father-son double to behold. I had hooked a beauty of a 19-inch rainbow that was performing acrobatics and raking my line all over a boulder when he announced he too had one on. His, a 22-inch rainbow, had picked his worm up while he'd been watching my fish do its thing. My fight quickly turned to a haul as I worked as quick as a could to get my fish out of his way and focus on him. We'd already determined we were keeping fish for the next day's dinner, so I essentially tossed mine to a pocket in the rocks and turned to help him. I expected mine would likely flop back in the water, but I didn't much care. By the time I was of any use to my son, he nearly had the fish to the bank. It cooperated with him uncannily. His little Batman kiddie pole is no fish fighter, and neither is he. But my only involvement in the whole fight, other than to keep my fish as far away from his as possible, was to step in the water behind the fish and tail it onto the bank. He'd managed to do the rest. He now laughed and laughed as he watched me wrestle two powerful fish at once on a steep, rocky bank. His was a fish I couldn't allow to be lost though. I knew he was already envisioning fillets on his plate. 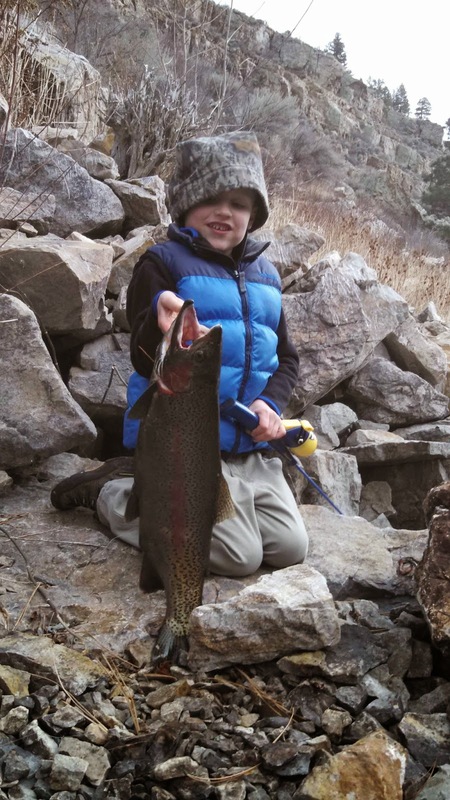 No five-year-old needs to be catching a 22-inch rainbow. I was in college before I caught a trout that size.